Social networking sites are unfortunately now major interest to malicious cyber criminals, spreading malware and building botnet army to steal money direct from your keyboards. 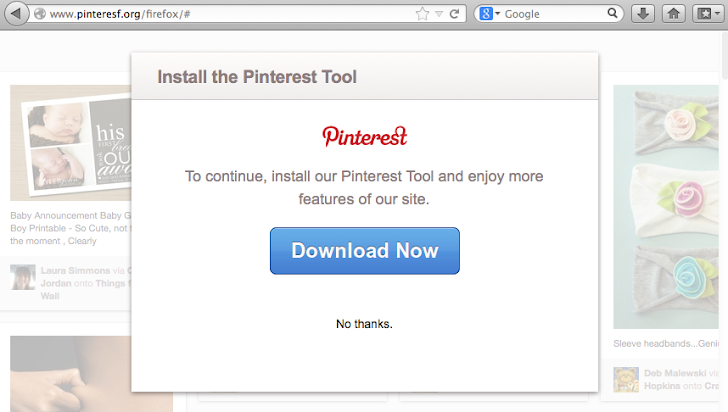 Janne Ahlberg, a security professional from Finland found and analysed an interesting piece of malicious code, offered as browser plugin, and infecting system to steal passwords from user's browser and also modifies the original Pinterest Pins links to spam with malicious links automatically. Janne's investigation claims that, this fake site offering a fake malware loaded browser plugin, harvesting passwords from users system. F-Secure Antivirus firm also detected it as “Trojan.PWS.ZAQ“. Similar malicious Pinterest plugin was first time spotted in 2012. Another researcher, Chrisjwilson has also analyzed the plugin and found that malware is modifying the original Pinterest Pins made my user and inserting malicious links to do spam. This malware gets the website specific payload from a remote server. Currently it seems to be limited to Pinterest, but estimated thousands of users are already infected. Update: Janne blogged that server IP addresses 198.58.104.37 , 50.116.28.142, 216.18.23.152 related to pinteresf.org spam are currently offline after public disclosure.